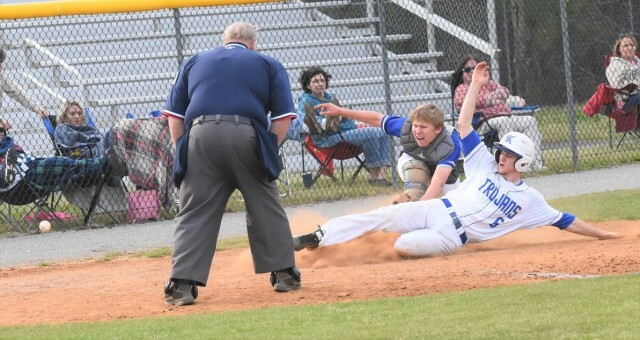 New Kent's Wyatt Terry (6) slides into home plate as the ball eludes Smithfield's catcher. New Kent’s Trojans’ baseball team can be really hot at the plate on one day and really cold on the next day. They were the former on Apr. 11 when Smithfield’s Packers visited for the Bay Rivers contest. A quick start by the homestanding Trojans was enough to lift the hosts to an 11-1 victory over Smithfield, removing the sour taste of a 24-0 beatdown by Lafayette’s Rams prior to Spring break. Early on, New Kent’s Chris Wade and Riggs Ellis reached first base on walks and was followed by John Mehalko’s single to load the bases. Benjy Boatwright received a free pass to first on a walk to give the hosts a 1-0 lead. After an error by the Packers allowed two runs to cross home plate, New Kent’s Wyatt Terry drove in two more to give the hosts a 5-0 advantage. The Trojans’ offense exploded in the fourth. Utilizing two doubles, six more runs crossed home plate. Meanwhile, the defense for the hosts held Smithfield to a mere run that came in the fifth inning. By that time though, the 10-run gap was enough for the slaughter rule to be enacted and the Trojans to earn the victory. New Kent Head Coach Michael Kuper talked about how his team is beginning to buy into the system to become successful. “It was great to recover from our last loss and good to come back and leave that behind us,” he said. “It got us back on the right track. New Kent returns to .500 on the season, posting a record of 3-3.